Well now, twice in one week; wonder what that means. Ten or so days ago I found myself left with a feeling of bleak sadness on rereading Stephen King’s Pet Sematary. It was a sort of ‘localised’ sadness: just this recognition of time passing and even ending for those who I love or have loved through the years. Of the Veil pulling back and Oz the Great and Terrible being at last revealed. 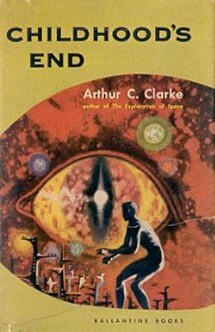 Arthur C. Clarke’s Childhood’s End, though…I didn’t expect the feelings that this one has left me with at all. I’ve never been an enormous fan of my own race, you see; often feeling like the guy who said that if there was a race other than the human one, he would join it. And I suppose that I’ve always vaguely felt that in a couple of centuries or so we would in any case probably have gone the way of the sabre-tooth tiger and wooly mammoth, leaving the Universe none the poorer. Certainly, I doubt that any passing intelligent life forms would take much pity on a species that delighted in both fouling its own nest and in pointing its horrendous weapons right at its own collective face. And yet that is what Clarke’s 1953 novel leads up to: the end of everything we are. Oh, it will be argued that humanity goes onwards to its destiny in the stars. And some may even see the ending as a happy one. But for myself, it left me feeling utterly, horrifically empty. I’ve never read this novel before and so it comes as an enormous surprise to find that it goes much further – much further – with the concept of evolutionary transcendence than 2001: A Space Odyssey does. There, Clarke contents himself with one Star Child – here, there are literally millions of them. But these Star Children can in no way be thought of as anything even remotely human any more. The human race dies out with their parents: these cold children of the galaxy are something totally Other. The book is in three sections, each one leading you into thinking that the story is going to go in one particular direction; but with Childhood’s End you quickly find out that you really can’t second-guess Clarke. Earth and the Overlords sees the is-it-or-isn’t-it benign takeover of the human race. Then, just when it seems to have settled into an enjoyable but conventional tale, it jumps –inside one chapter – ahead by thirty years. Then it is even further into the future and a whole other set of characters as we witness Earth experience The Golden Age, with Clarke outlining his idea of a Utopian Society and how it would eventually lead to a reduction in vigour and a drying up of artistic endeavors. It’s comfortable and may even be what Humanity wants – but is it what Humanity needs? It’s in the final section, suitably named The Last Generation, that for me Clarke hits greatness and I understand why this book has come to be considered a classic of its kind. I was literally shaken by the sense of loss I felt when I closed the pages and sat staring at nothing for ten minutes. Why did it affect me like this? Is it because I feel – or want to feel, or need to feel – that in some way I will still exist as an individual entity after death? Perhaps; but if it happens that the next stage comes as it does for Earth’s children in this novel; where they become like some sort of Borg or Invasion of the Body Snatchers mass-mind; if that is what we’re facing into, then I’ll go for oblivion and non-existence every time. And that’s probably what is bothering me: the thought of all individuality being lost. The Overlords we are supposed to ultimately pity, I think, because their genetic make-up forever holds them back from attaining this supposedly blessed state; but I feel that they are the lucky ones. They may be at an evolutionary dead-end, but they get to face it as themselves. Another personal level on which the end hit home: I’m one of those people who has never understood what it means to feel ‘lonely’. Don’t get me wrong, I understand the concept of loneliness; it’s just that I’ve never actually experienced loneliness, despite spending a great deal of time on my own, which is a completely different thing. Yet on reading the predicament of Jan Rodricks, literally the last human being alive, Clarke gives us an awesome picture of truly cosmic loneliness – and I had a glimmer of what it must feel like to really be lonely. Childhood’s End is an epic in scope. It gives us totally believable world-building whilst throwing in a disparate number of themes and red herrings; a look at the ‘supernatural’ that actually includes messing about with Ouija boards; and even takes time out to explore Clarke’s own beloved undersea world. And he does it all in 250 pages. This is one that lives up to its reputation. I also maintain a politics blog, just for kicks!